Many folks consider the myriad options available to stop the aging clock. Whether it is a surgical procedure, botox, hair implants, or a chemical peel, Fishers residents have countless choices to help them look more youthful. I am Dr. Dale Behner and I am exited to tell you about a simple and affordable cosmetic dentistry procedure we offer at Dental Care Today that can create a younger looking you. At Dental Care Today, our porcelain veneers will improve the color of your teeth, cover chips, cracks, or misshapen teeth. Veneers can lengthen teeth that look too short, fill in gaps between teeth and cover any irregularity your teeth may have. Porcelain veneers reflect light the same way natural teeth do making them a great choice for a smile makeover. If you are a middle-aged (or older) Fishers area resident pondering ways to improve your appearance, Dental Care Today can help you turn back the clock by creating a youthful smile. 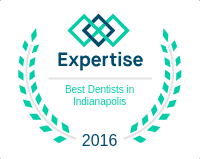 Dental Care Today has been serving the folks of Fishers since 1985. We offer affordable, professional services including sedation dentistry, dental implants, and dental veneers. The smiles in the 46037 zip code area can rival those of Beverly Hills 90210 thanks to porcelain veneers. Contact Dental Care Today today for a younger you! ‹ Could Bad Breath Suggest A More Serious Problem?